What Are The Jbl Flip 3 And Flip 4? In our increasingly technological world, companies and manufacturers work tirelessly to bring products of leisure to our homes for affordable prices. Leading the front lines of this innovative war are well-known and popularly trusted brand names such as Bose, Klipsch, Jbl, MPOW, and many others who are dedicated to bringing us the best products with the highest quality for the cheapest prices. As these manufacturers battle it out to see who can become the top and most trusted brand name for consumers, the result is amazing products that keep getting better and better. These companies pride themselves in bringing fresh ideas to the table and also perfecting older well-received models to improve any shortcomings of existing products. Technology experts, audiophiles, and new consumers just getting their feet wet in the vast universe of consumer electronics and audio devices will all find something to enjoy from these brand names. The Jbl Flip 4 vs Flip 3 the comparison is a prime example of a manufacturer working tirelessly to improve upon a popular consumer item and tweak it to be better and less flawed than the previous version. The Jbl Flip 4 vs Flip 3 are both wireless speakers for listening to music. These speakers hook up to any mobile music playing device via Bluetooth so that there are no annoying wires or plug-ins needed. There are many wireless Bluetooth capable speakers on the market nowadays, but the Jbl brand and specifically the Flip 3 and Flip 4 set themselves apart from the competition with their looks, abilities, convenience, and durability. The Jbl Flip 3 measures at 69 x 164 x 69 mm and weighs only 450 grams (not even one pound). 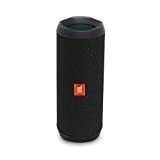 Manufacturers at Jbl have made the exterior of this small portable speaker from a mixture of woven mesh fabric and silicone rubber that adds to the speaker's durability. One can easily throw it into a bag and take it with them on the go without suffering scratches or dings. Even more, durability exists in the Flip 3's manufacturing as it is made to be splash proof. 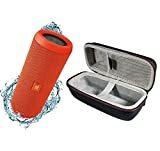 While this is not the same as water proof in that one can not completely submerge it in water, it can withstand a day at the beach, by the poolside, or an outdoor rainy day with ease. For added fun and a more immersive experience, the manufacturers at Jbl included Connect technology in their patent of the Flip 3 so that users can easily sync multiple speakers together. Using these around the house can make for an unparalleled surround sound experience! The frequency response range of this small speaker packs a surprising punch for its unimpressive size. Its full range is from 85 to 20,000 Hertz, and users report that the bass makes its presence known with a slightly boomy-sounding frequency. The emphasis on the bass tends to drown out the mids and highs at louder volumes, making the speaker lose some of its balanced sound credibility. The Flip 3 runs for about ten hours on battery power per charge and takes about three and a half hours to recharge fully. This is both an impressive and above average power for most portable speakers, which only play around six to eight hours per charge. To give even more perspective on the Jbl Flip 4 vs Flip 3 portable speakers, we decided to also compare them to the Charge 3, another closely related Jbl speaker. Though the Charge 3 and the Flip 4 look very similar in their respective designs, the Charge 3 is a lot larger. With dimensions of 213 x 87 x 88.5 mm and a weight of 800 grams, the Charge 3 speaker is almost twice the size and weight of the Jbl Flip 3 vs Flip 4. The Charge 3 sits with front and back facing speakers, play, pause, and volume control buttons on the top, and LED battery life indicators on the bottom. The Charge 3 features the same IPX7 rating that the Flip 4 has, meaning that both of the speakers are waterproof and can be submerged in up to one meter of water for up to thirty minutes. Because of the size of the Charge 3, there are lots of room for the battery, and this becomes evident in the overall life of the battery. While the Flip 4 offers up to twelve hours of playtime on one charge, the Charge 3 offers an impressive twenty hours of playtime. Both the Charge 3 and the Flip 4 have directional speakers in the front and the back of each respective speaker. This means that no matter where one is in relation to the speaker, the quality of the music will sound the same and will not be muffled. Because of the size difference between the Flip 4 and the Charge 3, the Charge 3 offers much bigger sound. Not only is the quality louder and bigger in the Charge 3, but there is more room for deeper bass as well. The frequency response range of this speaker is 65 to 20,000 Hertz, a small improvement over the Flip 4. Most speakers that put all the power into a formidable bass lose their balanced sound, and the mids and highs tend to be drowned out by the overwhelming low frequencies. The Charge 3 challenges this formula and makes an extra effort to balance and fine-tune its midranges. Some users complain that the high ranges could use a bit more punch, but for the most part, this speaker offers the most well-rounded sound out of itself, the Flip 3 and the Flip 4. The astonishing sound quality is all thanks to the two 45 mm drivers within; they help provide the amazingly deep bass of the speaker. The Charge 3 also features stereo speakers, which allow different frequencies to come out of the left and right sides separately. This helps the sound range seem fuller and more crisp. This speaker, as well as the Flip 3 and Flip 4, offer a speakerphone function that allows one to take phone calls via the speaker. 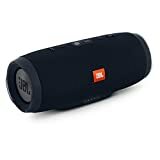 These speakerphones are just an extra addition to the many features of the speakers, but Jbl manufacturers treat it as an essential part of portable speaker enjoyment. As such, the speakerphones of all three of these speakers offer high quality, crisp audio so one can hear who they are talking to clearly. The Charge 3 has the same Connect technology that the Flip 3 has, but does not have the Connect+ technology that the Flip 4 has. Think of the Charge 3 and Flip 3's Connect technology as an earlier generation with more limitations than the Connect+. The Charge 3 requires a slightly longer time to charge than its Flip 3 and 4 counterparts due to its size and battery life. Being able to play nonstop music for twenty hours on one charge means that the Charge 3 will take around four and a half hours to fully charge up versus the Flip's three and a half. Compared to the Flip 4, the Charge 3 has larger dimensions, the same color variety in its physical designs, almost twice the playtime on one charge, and twice the battery power to match. It also comparatively features 5 mm larger dual stereo drivers, a 5 Hertz lower frequency response range, a more outdated Bluetooth version, 2 x 10w rated power versus Flip 4's 2 x 8w, and a signal-to-noise ratio of greater than 80 dB. At a higher volume, the sound does not noticeably distort. If one is looking for the highest quality sound with the best range, the Charge 3 is the way to go. However, if one cares more about durability and portability and still wants formidable sound, the Flip 3 or 4 are a fine choice. We put all three of our compared items in this article in an easy-to-read chart form for a quicker comparison. ​​The Jbl Flip 4 vs Flip 3 measures at 68 x 175 x 70 mm and weighs around 515 grams (slightly over a pound). This speaker is a bit heavier, taller, and slimmer than the previous generation Flip 3. Though this is not a huge difference in size or weight, consumers report that the small adjustments to the body of this speaker improve its portability. Since the bass of the Jbl Flip 4 vs Flip 3 both have powerful bass, the Flip 4 comes equipped with a manufactured flat strip along the entire body. This strip helps the speaker stay in place at higher volumes as the bass has been known to cause the speaker to roll around and rattle quite a bit. Manufacturers did not forget to make improvements from the Flip 3 in the esthetics and visually pleasing department either. Everything from the buttons to the logo on either end of the speaker have been designed to look more professional and sleek. The physical feel of the body of the speaker is a smoother and softer improvement from the Flip 3 as well. The Flip 4 is completely waterproof, not splash proof as the Flip 3 before it was. The Flip 4 has a rating of IPX7, which means that the product is first and foremost dust-resistant. This rating also means that the speaker can be completely submerged in water as deep as one meter for up to thirty minutes sustaining no harm to the device. Yet another improvement in the Jbl Flip 4 vs Flip 3 is in the technology within the speaker. Where the Flip 3 came equipped with Connect technology making it possible to sync other Connect devices for a more immersive experience, the Flip 4 comes with Connect+ technology. This is the next generation of this amazing technology, allowing an impressive up to one hundred other Connect+ enabled devices to hook up to one another. This technology makes this speaker a top choice for house parties and get-togethers. As the most important aspect of any audio device is the sound quality, manufacturers did not forget to leave these improvements out. Expanding on the already above-average 85 to 20,000 Hertz frequency response range of the last generation Flip 3, the Flip 4 goes even deeper. Boasting an impressive 70 to 20,000 Hertz frequency response range, the relaxed bass line of this speaker has a noticeable difference that one can even hear when listening to the Jbl Flip 4 vs Flip 3 side by side. The internal dual 40 mm stereo speakers also assist in the crisp, clear, and a full range sound of this speaker. Where the Flip 3 fell short in sound with the drowned out mids and highs, the Flip 4 is an absolute improvement. Not only are mids and highs generally more balanced with the bass, but the frequency range as a whole suffers no lack of clarity and crispness even at higher volumes. The power and balanced sound of the Flip 4 is a force to be reckoned with. Where the Flip 3 ran for about ten hours on a fully charged battery, the Flip 4 offers yet another improvement with an additional two hours of playtime per charge. The number of choices out there for portable speakers can be overwhelming, even when one narrows their search down by brand name. We hope we have given you a lot to think about as far as the Jbl brand and the Jbl Flip 4 vs Flip 3 goes, and we think it would be a wise choice to go with the new and improved version of an already well-liked product. As with any wide range of consumer products, portable wireless Bluetooth speakers offer designs and purposes for every personality out there. If you are someone who considers themselves an audiophile who is experienced in high-quality audio devices and you are willing to spend more money to get better sound, more power, and more specs, Jbl's Charge 3 would be a wise choice for you. If you are someone who, like most consumers, is conscious and wary of how much they spend but you still want a formidable speaker that will do justice to your tunes, the Flip 3 and Flip 4 are the answers to your prayers. Both are under $100 making them highly affordable, but the manufacturers at Jbl still put the gentle care and attention into building these speakers that make them able to be compared to speakers twice their size and price. For people who live on the go adventurous lifestyles, the Flip 3 and Flip 4 can more than keep up with you. Splash proof, waterproof, long-lasting battery life, and highly durable design that is still sleek and professional, these two speakers are the stuff of dreams for the outdoorsman, and I would highly recommend either of them, especially the Flip 4, to audiophiles, technology experts, and novices alike. The JBL Flip 4 is a sleek and stylish Bluetooth speaker that has the Connect + technology. It has twelve hours of playtime on one charge and it is built with a improve frequency response range. However, its bass can be overwhelming for some people.